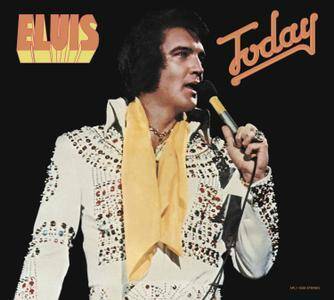 The 40th Anniversary Edition of "Today", the last studio album to be released during the King’s lifetime, contains the entire original album while premiering 10 un-dubbed mixes from the sessions, providing a new intimate listening experience. Now, for the first time on an official release, fans can hear Elvis's pure unvarnished performances of these songs, freed from the controversial "countrypolitan" overdubs on the original 1975 release and compare them to the more polished versions of the finished album. Disc 2 features live performances given within weeks of the album's release. Previously issued in 1980, this constructed show has been remastered and reassembled from original source tapes to offer improved audio definition. As it turned out, Today would be the last full studio album Elvis Presley recorded in his life. Headed out to Hollywood to collect the Grammy he won for Best Inspirational Performance of 1975 (it was awarded for a live version of "How Great Thou Art"), Presley booked sessions in RCA's L.A. Studio C with his longtime producer Felton Jarvis and settled in to knock out ten songs over the course of three days. Because it opens with the rollicking boogie "T-R-O-U-B-L-E" – a legitimate throwback to the dawn of rock & roll – and also finds space for the down-and-dirty gospel-soul groove of "Shake a Hand" and Billy Swan's cheerful "I Can Help," Today was pegged upon its initial release as something of a return to Elvis' Sun roots, but the rest of the record plays straight down the middle: a collection of Presley's preferred majestic ballads and MOR pop tempered by a touch of lushly produced Nashville country. This combination had long been a winning one for Elvis – it's the blend developed in the wake of 1971's Elvis Country (I'm 10,000 Years Old) – but in 1975, it was slightly past its sell-by date, so it didn't quite sell in blockbuster numbers ("T-R-O-U-B-L-E" did turn into a hit, nearly cracking the country Top Ten and revived in 1992 by Travis Tritt). Nevertheless, these era-specific concerns fade over time and leave Today standing as an excellent latter-day Elvis album. Those rockabilly revivals find Presley game and loose, as does a nimble version of the Statler Brothers' "Susan When She Tried"; the trio of orchestrated ballads (Don McLean's "And I Love You So," Jerry Chesnut's "Woman Without Love," Troy Seals' "Pieces of My Life") give Elvis an opportunity to find a moving heart beating underneath the shine, a skill that also enlivens an almost corny version of the '60s standard "Green, Green Grass of Home"; while the country reinvention of the Pointer Sisters' "Fairytale" and the soulful rendition of Gregg Gordon's "Bringin' It Back" are expert adult contemporary – gorgeous and skirting the edges of being overwrought. Added up, Today touches upon nearly everything he did well in the mid-'70s – a nice portrait of Elvis at a time when he was still an active, thriving working musician and a record that remains easy to enjoy today. Thanks to the Original customer!